This dish is so simple, yet it's packed full of flavor and good things like peppers, potatoes, onions, salsa, and protein-rich eggs. (That's right, despite a common misconception, eggs are not dairy and are perfectly suitable for people with allergies to dairy but not eggs.) This recipe is for one large omelet, but it's easy to double, triple or quadruple! And it's versatile in that you can serve it with a variety of toppings--like guacamole or dairy-free sour cream--and you can also opt to add in other vegetables and herbs that you have on hand or are craving. I prefer preparing my omelets as directed in the recipe--by folding the omelet half-way through and allowing the middle to cook inside the omelet--instead of cooking each side by flipping the entire omelet. The result is fluffier and more fun to eat! In a large frying pan, heat the olive oil or dairy-free soy margarine, adding the potatoes once hot. Cook until the potatoes are crisp and golden brown, then add the green pepper and onions to the pan. Cook until the onions are soft and fragrant, about 3-4 minutes more. Remove the pan from heat and set aside. In a small mixing bowl, whisk together the eggs and soy milk for 1-2 minutes or until well-beaten. Return the pan to the stove over medium heat. Add the eggs over the potatoes and vegetables and cook until the underside begins to brown and the surface begins to solidify. Spoon several tablespoons of salsa on top of the eggs. Once the omelet has set, loosen the edges from the pan with a rubber spatula and very carefully fold over one side of the omelet onto the other to form a crescent shape, pressing the edges slightly to seal.​ Cook for a minute more, then flip the folded omelet over and cook the other side for one minute more. 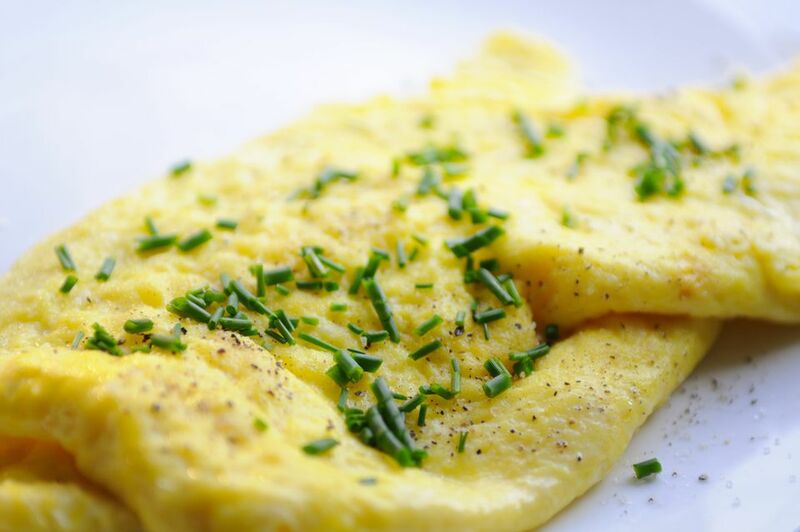 Transfer the omelet to a serving plate and serve immediately with salt, pepper, and salsa to taste. *This recipe as written is suitable for dairy-free diets, but as with any recipe intended for persons with dietary restrictions or allergies, make sure to read the ingredients labels on all ingredients to make sure that there are no hidden dairy-derived ingredients or other allergens that apply to you.